Sit up to the table in maximum comfort in the Amish Malibu Dining Chair. With a curved back for additional lumbar support and the gorgeous solid wood of your choice on display, you can rest assured your dining room will be active and thriving with this elegantly styled dining chair. Malibu Dining Chairs begin in the heart of Amish country. All of our Amish furniture is handcrafted by skilled woodworkers who create strong, durable, beautiful furniture. The arm chair option for this design will draw interest as the graceful wooden arm seems to float by itself! The top-notch construction of these chairs brings the arm to curve up without being attached to the chair back. Shown here in Cherry wood with a Washington Cherry stain, these distinguished chairs are ready to host everything from family reunions to holiday banquets in style. Not sure of your favorite style? 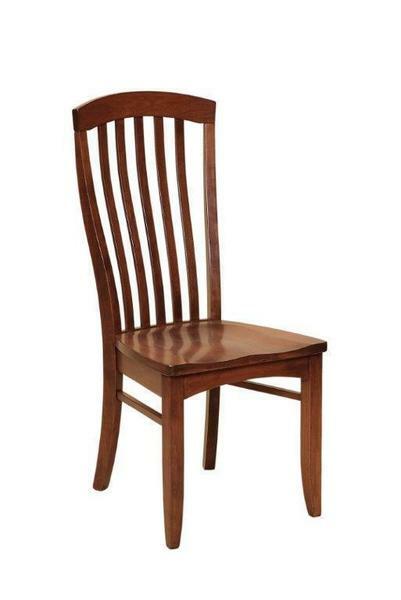 Visit our blog to review our Dining Chair Guide for help. Consider our Ventura Amish Dining Chair for another option.